Marxist geographer Neil Smith wrote about new urban frontiers, rent gaps and the vengeful nature of uneven development and gentrification. The intense redevelopment of Leith exhibits many of the classic elements of this form of capital-driven economic expansionism. The town has been undergoing gentrification since the 1980s, but more recently has become known (and has marketed itself) as a hip and cool place – an independent place. Artists, hipsters and other “creatives” have flocked to the area, further fuelling its gentrification. Yet, it is planned development – and this means planned dispossession and displacement of working-class people, ethnic communities, small businesses, etc. – that is responsible for the social and ethnic cleansing of Leith. At its heart are economics and politics, not artists. Neil Smith was clear that gentrification resulted from the marriage of capitalism and global corporate and financial interests. It’s therefore rather ironic that Smith was born in Leith – he was a Leither – because most people fighting gentrification in the town have never heard of him, even though what’s happening there mimics the case studies in his earlier work. Yet, whilst the decisions to sell-off Leith to the highest bidders were taken by political leaders at local and national level, so were the decisions to use art and the creative industries to support the state-led, planned gentrification of the town. This article explores how Leith’s relatively small creative scene has been and is continuing to be seduced into working with the state and corporate developers as a form of political soft power that leads to a collective artwashing of the town; to the notion that art and its sinister twin “creative placemaking” can “Make Leith Better”. Make Leith better for who? For local people, or for corporate interests? Why anoint artists and creatives as the missionaries of placemaking, of improvement, and, ultimately, of uneven capitalist development driven by accumulation by dispossession. For, as Smith wrote, gentrification is all about “‘making cities livable’ … for the middle class” even though “they have always been ‘livable’ for the working class”. Regeneration is frequently sold as bringing benefits to everyone – existing working-class residents and middle-class incomers alike – but this is usually untrue. Although it doesn’t and shouldn’t be this way, regeneration in a neoliberal state is all about profit in its most primitive form: profit achieved from theft; from land-grabs. Leith has suffered from a lack of investment – from disinvestment – for a very long time. But that too was planned. The middle-class is now wreaking its revenge on Leith’s working-class – on the town’s communities that have remained incredibly strong throughout numerous hardships. First gentrify the waterfront, then increase tourism; earmark gap sites along Leith Walk for development; encourage arts organisations and artists to use “meanwhile” spaces and the town itself as a canvas; develop gap sites; redeploy the arts to new sites; send in the trams. This is not the end some imagine. Rather, it is the beginning of a vengeful political plan to turn Leith into Edinburgh’s new middle-class quarter. Once the Leith Walk “corridor” – a route that connects the Michelin Star restaurants at the port with the centre of Edinburgh – is gentrified, “sites” to each side of it will be targeted as new “opportunity areas” – and that means council estates and green spaces. Artists’ studios are already simultaneously moving outward and occupying gap sites. To new sites like, in the case of Edinburgh Palette, an empty office block on Ferry Road and a pop-up box park in Portobello. And to gap sites like, in the case of Out of the Blue, at 165 Leith Walk and the site of the now demolished old tram depot behind it. The role of artists and the creative industries is, as Smith explains, to convert “urban dilapidation into ultra chic” as “block by block” and “building by building”. This is as Rosalyn Deutsche and Cara Ryan described it in 1984, “the fine art of gentrification” – and street art, murals, shutter art, art walks, outdoor film events, etc. are all part of art’s role as the commodifier of urban space. Art functions here to cast Leith as Edinburgh’s “cultural mecca” – a place of consumption; for tourists, art-lovers, hipsters and, finally, for developers and their middle-class clientele (whether buyers of new apartments or temporal residents in student accommodation or hotels). Art, as Smith pointed out, serves to tame places – to create an “exotic” yet benignly dangerous façade. This is the role of creative placemaking to sanitise and normalise creativity – middle-class creativity – in an area previously considered as “dangerous” and a “no-go zone”. This is artwashing. The presence of art and artists ultimately leading to increased house prices and monthly rental costs that displace local residents and businesses and the artists and arts organisations themselves. So, when property developers and estate agents begin to dominate boards of local arts organisations operating on and around Leith’s “gentrification frontier”, and when the Scottish Government, its agent Creative Scotland, and Edinburgh City Council begin funding most of the “meanwhile” activity around the town, it begins to look as though the planned gentrification of the area (and surrounding areas) is being artwashed. This is state-led artwashing. The argument here is not to blame artists – an accusation many people often make about my work. Rather, I argue that the state-led artwashing of Edinburgh is (like everywhere) planned and delivered by public-private partnerships. Nevertheless, many boards of arts organisations contain people with clearly (in some instances) and potentially (in other cases) vested interests in the gentrification of Leith and other parts of Edinburgh. Creative Placemaking duo Morvern Cunningham and Duncan Bremner provide Leith with much of its “street” vibe and its creative “blueprint” to “Make Leith Better”. They operate as Citizen Curator, Leith Creative and Leith Late, often alternating as lead partners for the same funders. They are frequently funded by the Scottish Government, Creative Scotland and Edinburgh City Council. They recently received £70,000 from the Scottish Government and Creative Scotland to develop their previously funded Blueprint into “Make Leith Better” – a series of further consultation events and design charrettes. Their A Wall is a Screen – an outdoor film screening and walk around some of Leith’s working-class areas – received a total of £13,500 for the one-night event from Glasgow 2018 and the bizarrely neoliberal local community fund £eith Chooses. The events are billed as “community engagement” and “audience development” activities but primarily serve to deliver policy outcomes for state planning initiatives as well as helping advertise Leith to fellow creatives. Board members of Citizen Curator include a senior researcher to the Scottish Government and a staff member of Out of the Blue. Out of the Blue is another Leith-based arts organisation and studio provider which owns the Drill Hall and has studios at Abbeymount. It also runs the Bongo Club. It is funded by Creative Scotland and Edinburgh City Council. It is currently working as a partner in the redevelopment of 165 Leith Walk and the old tram depot behind it, turning the original building (which it used as studios) into new studios and a pop-up box park and artists’ market, amongst other things. The “meanwhile” project has received a total of £1.3 million from the Scottish Government and Edinburgh City Council for a project that will last little more than 4 years before the entire site is redeveloped with a mixed-use development which includes a significant number of new apartments but no reference to social housing at this time. The project is led by public-private partnership Hub South East. The list of directors of Hub South East includes directors of major UK property developer Galliford Try, venture capitalists, estate agents, other property developers, a senior Barclays Bank executive, members of the Scottish Futures Trust, council executives, merchant bankers, business development advisors, etc. Other project partners include NHS Lothian, the Scottish Government, Edinburgh City Council, Capital City Partnership, Reiach and Hall Architects, Morrison Construction (a company owned by Galliford Try), and more. The trouble is that this development is opposite the currently contested space at Stead’s Place. Drum Property Group is seeking to demolish the site and displace existing businesses. Its actions led to the #SaveLeithWalk campaign which now has more than 12,000 signatories. Drum are partnering with Edinburgh University and massive Tory-supporting housing association Places for People at the site. Yet Out of the Blue have had discussions with Drum and hosted their planning consultations earlier this year. Why? Viewed together, the planned developments at Stead’s Place and at 165 Leith Walk / the old tram depot represent the total renewal of this key section of Leith Walk – its total gentrification. The sites have long been earmarked for development by Edinburgh City Council. The developers and arts organisations are only doing their jobs: the former to develop and make as much money as possible; the latter to provide a “meanwhile” cultural gloss that will artwash the gentrification process and bolster future purchase and rental prices. Drum even (unsurprisingly) suggested that both its temporary boarding of the empty spaces at Stead’s Place and the new development planned to replace them should include “community art”, murals and such like! This is all rather unsurprising given Out of the Blue’s board of directors. Phil Denning is a senior figure in the Scottish Government’s Education Scotland and on the boards of various film festivals in Edinburgh (via his role at the Centre for the Moving Image). Vanessa Boyd has links to the Edinburgh Festival and Creative Scotland. Gregor Mair is a once-disgraced solicitor who now works for Gibson Kerr estate agents in Leith. Dr David Stevenson is a well-respected academic at Queen Margaret University Edinburgh who specialises in cultural policy and cultural management. There are others too. However, it is interesting to note the Out of the Blue director Mike Davidson is also a board member of Creative Edinburgh – a network organisation that lists many of the people mentioned here as members. Creative Edinburgh is also funded by Creative Scotland and Edinburgh City Council. And the Out of the Blue project at the old tram depot is also a project which was set up by Stephen Oswald who was Hub South East Development Manager until 2017. He still plays a role in the development, although it is uncertain as to who he is now working for, other than his current company – none other than Places for People Scotland where he is a director and its chair. Will Places for People Scotland deliver the housing planned for the Leith tram depot site? Oswald was only appointed to the board of Places for People Scotland in April 2018. And he has also been a director of Edinburgh Palette since 2015. Edinburgh Palette will be moving out of its long-term “meanwhile” space at St. Margaret’s House in Meadowbank in 2019 because the building has been purchased by none other than Drum Property Group. The development partner is Places for People Scotland. So, Oswald is a director for the arts organisation on the one-hand and the development agent on the other. He is also still involved in the Hub South East project on Leith Walk mentioned above. Of course, Edinburgh Palette will be moving to the two new sites to the east and west of Leith where the organisation will provide artists studios in “meanwhile” spaces whilst generating the sort of buzz that developers love – the hum of rising property prices and the widening of rent gaps. Artwashing seems to have came relatively late to Edinburgh but the city seems to have embraced it wholeheartedly as, egged on by the Scottish Government, it sells its once neglected areas to national property developers and housing associations backed by global investors and investment funds. Artists are mere pawns. It is inevitable they will be displaced because that’s the plan. The state’s plan. Yet, at least artists have some agency and ability to move on – to ride the inevitable next wave of gentrification and displacement. Many working-class people and communities and small business owners have little chance other than to go where they can – and that is likely to be as far away as Edinburgh city centre and towns like Leith as is possible. Artists can support communities to resist and even overthrow planned gentrification, but their actions must be independent of official support or corporate backing. It’s a question of “which side are you on” and the artists and arts organisations mentioned here are clearly in no position to oppose the planned development or take real action in support of embattled community members. How can they? Leith and its creatives must ask itself a question. It’s about time people were honest and transparent about their relationships and their ambitions. Crucially, it’s important to ask, “who pays the piper?” Clearly, the pipers here are so deeply indebted to the state, local government and, increasingly, to corporate interests and financial investors, that they will only sing one tune – the siren song of neoliberal exploitation. As a Right of Reply, Morvern Cunningham and Duncan Bremner wrote this in response. Having lived in Leith for the best part of 20 years through the 80’s and 90’s I witnessed first hand the land grab of the “new port of Leith” along Leith’s waterfront. I worked in the Docks and ofcourse it became obvious this had first to be ‘cleansed’ by removing all industry and ‘working class activity’; filling in industrial dock land space for property development. The early siren call was the separation of the “new port” from the proletariat Leith who’s little Leith Pagent was followed later by the ‘New Port of Leith Festival’which if I recall was provided security by the Police ring-fencing the area for the Hoi Poloi to sip their Chablis in peace and relative tranquility and in the absence of undesirables; or ‘indigenous people’ as a nouvaux riche patron of Fisher’s bar once referred to me and some friends. I moved away from Leith and the central belt in the late 90’s and having witnessed the ‘ethnic cleansing’ and rentier classes slaughtering the character of Leith and indeed Edinburgh, I have absolutely no plans to return. I discussed the forementioned with family still residing in Edinburgh recently upon my visit to the Festival (Oh Dear! .. another analogous tale)where I witnessed first hand the corporate takeover of Edinburgh’s sole; with regard to the working classes of Leit, those in discussion asked me.. “what right do the working classes think they have to claim Leith” … says it all really. “The neoliberal local community fund £eith Chooses”. How so? Are you questioning the principle of participatory budgeting or the Leith Chooses model in particular?Plenty of evidence globally of the value to local communities of the democratic reallocation of funds via PB. It places groups into competition with each other. It was also easily gameable, all one required was to enter an address in leith online. BAME groups whose first language is not English also lost out as did groups with a high amount of elderly people. Groups that have been in Leith for many years. That’s what I’ve heard and noted from the list of successful applicants. For me, this article suffers from a lack of definition of what “neoliberalism” is. Is it the usage of the 1950s and 60s, when it was seen as a social democratic middle-ground between classical (free market) liberalism and the centralised state-planning of socialism? Which would seem to fit the state role identified here. Or is it the current usage, which is a relabeling of classical (free market) liberalism, where the state is to be reduced and the market given more power? In which case it doesn’t seem to fit what is being described here, where the state is still quite closely involved. The privatisation of Forth Ports in the 1990s would be a better fit with that. But I don’t think artists exist as a single class or viewpoint, and so are unlikely to mobilise. More practical might be better local democracy. Leith was at one time its own authority – and though much of the development of the town and the docks can be attributed to capital – it was done under relatively local direction. I’m referring to neoliberalism in its present form. Although the idea of the state making way for the market is false. The state plays an even greater role now facilitating and protecting the market. This is the fundamental problem with Pritchard’s approach: it’s a question of “which side are you on” – he’s symptomatic of the current political climate that lacks any intelligent nuance. He feigned concern for the vulnerable and marginalised Leithers that have not been engaged by the various public consultations and inciting them to take direct action, risking arrest – with no concern for whether or not that may make chaotic lives worse. I’m not an artist, I’m not a creative, I’m not a developer, I’m not a Leither but I know helicopter activism when I see it. And yet you helicoptered yourself into the discussion despite having nothing to do with any of the subjects whatsoever…. saying a community Councillor might have a conflict of interest because they also work for out of the blue is slander? My goodness. Sorry? Can you expand please? Aye, plenty of good points here but it feels like we’re being saved. I’m not here to save anyone… Just a visitor asking questions and responding to genuine concerns… There are genuine concerns. Do you disagree? The person is vice chair of LCCC. He also heads up or is part of a ‘task force’ opposing the knocking down of Steads Place by Drum Property.. He is also the financial manager of OOTB who has had “chats over a cup of tea” regarding the SteadsPlace proposal with Drum Property. The words of Fyfe Hyland Drums PR man, words at an actual LCCC meeting with the person present. All true. People pointing out a possible conflict of interest isn’t slanderous, it is a must in such situations as big is this. Surely you can see that? There has been no suggestion of illegality on his part (in fact I would say it is THEIR right (OOTB) as a business to explore different avenues of expanding and growing/ but if they are thinking about doing business with Drum the very least they could do is issue a statement either way, saying, after talks, chat, discussion, we are not interested now or in the future of doing business with Drum. Or have the decency and balls to say yes we are interested, going against the wishes of 10,000 people so far who have signed a petition against it. As a taxpayer subsided body think it’s the least they could do either way to clarify. People see things differently and with respect ( and I don’t agree 100% with the organiser of this meeting on all things) but I believe he has the right to air them and comparing the meeting at the church hall like some sort of Momentum meeting, please. I didn’t see any sign at the door saying momentum members only. I didn’t see people shut down in talking about anything they wanted in the sense of somehow going off message of some sort of Momentum rhetoric? You point out the negative aspects (that can and usually do happen at an open free to say what you want meeting, (I don’t know Duncan from LC) but the guys manner in questioning him (at the back) was uncalled for in terms of swearing in parts but Duncan got a right to reply and in his manner I would say came across well. Also for balance (I don’t know Morvene) but when she chaired the meeting at Thomas Morton Hall I thought she done well (genuinely). That said, when your local MSP asks a direct fair question regarding the viability of a building (Steads Place) and gets a response from Drums representative along the lines of ” we are a private company, don’t need to tell you anything and won’t” you can probably see why there are so many people now wanting answers to questions that are not forthcoming and are a bit peeved off. Shutting down discussion because people may not like it is not the way to go. Especially at a time like this in Leith. One thing you didn’t mention. Don’t know if you were still there. Did you hear the manager of the Citadels youth clubs words (and I definitely don’t think he is part of Momentum)? Passionate, eloquent, fair and to the point and he, im’e guessing, knows better than most about the impact gentrification, de-industrialisation and displacement of families from the Leith area had had because of unaffordability and proliferation of developments like this and developers keen to exploit art for propaganda purpose and vast profits, taking up land leading to less chance of real social affordable housing being built. He was pretty much spot on imho and the round of applause response would say most agreed, There is a lot to talk about. Stephen Pritchard is a also an artist who has been funded by arts council England for many years. Who pays him I wonder? Bit hypocritical to be state funded for many years then point fingers though. Sorry, still hypocritical. You are still state funded! Who funds the movement for cultural democracy?A quick look on your blog shows you have been funded for many years and involved in a variety of “creative” art projects. Set your ethics up however you want. Reading through Stephen’s blog and other material online, it looks like he has a decent amount of respect and acknowledgement regarding his ‘artwashing’ research. The interesting thing to observe, is how much the ‘creative establishment’ do not like any form of critique or scrutiny. Lot’s of people appear to be affiliated with and are directors of different groups, all receiving sizable grants from Creative Scotland but what do they actually do? They are quick to claim themselves as champions of the local community but most of these communities existed quite happily before they turned up and insisted everything needed a paint job….and quelle surprise! what happens once the merriment of their involvement has passed? The same community that they claim to be ‘engaging’ with or holding ‘conversations’ with, end up priced out of the very place they are from! Thanks Fiona. People have suggested that I’m parachuting in to “save” Leith. That’s not true. I’m just asking questions. I wonder who are the self-appointed saviours of Leith? And who are backing them? Are they missionaries, mercenaries and/or mobilise? You have insulted my friends. Corporate branding? That’s interesting. I do not wish to offend. Apologies if you feel I have. Which friends? There’s definitely something to this idea of artwashing, but while what Drum and Edinburgh University are proposing at Stead’s Place can easily be said to operate within that framework (and locals spotted this straight away), what Leith Creative, Leith Late, and other arts & cultural organisations (e.g. Neu! Reekie, Leith Festival, Rally & Broad) do and have done just doesn’t fit. These are potential allies to the purported cause of this piece – why cast them as opponents? This isn’t the first time this author has tried to implicate a few well-meaning and generally well-liked people and projects in a grand conspiracy without any evidence of collusion, and I doubt it will be the last. It’s a genuinely interesting idea and I’m sure there are lots of small scale projects around the country to test it out on – I just hope the author has some way of telling when it is happening, and when it’s not. It’s vital that people continue to be critical of the ways in which art, culture, and community are leveraged by governments and big business, but the best arguments are those that acknowledge their limitations. There are various criticisms of all sorts of people and projects on your blog. Some I can get behind – like the criticisms of Drum and Edinburgh University here, but some are misplaced and poorly executed (e.g. the treatment of Homebaked on your blog). Again, it’s so important that people stay critical about such things, but it’s also important as a researcher to be able to take a step back and reflect on your analysis. I hope you continue to find support for your work amongst locals here and wherever you go next, but please do try to engage with and take on board the opinions and experiences of those who disagree, and do so reasonably and respectfully. While your general critical approach can provide helpful insights into relationships between art, governments, and big business, there are plenty of people who live and work in Leith saying that you have misinterpreted some of the details of this picture. I hope you will consider this a possibility. and there’s the rub Tom – just because someone moved here or works here does not (I’m sure you’ll agree) give them a mandate to decide what is best for that community. Calling yourself a Leither and making a few Trainspotting references does not entitle you to present yourself as somehow representative of Leith. If these people are so representative, can you name me anyone among them that has focused on the lack of social housing in one of the most heavily populated areas of Scotland ? Vague references won’t do – Leith Creative claim from their data that people did so but also suggested a community development trust – do you really believe that a large number of people made reference to this ? As coincidence would have it – I hear that such a trust is already being promised funding by a party that will be building houses for rent which excludes those on benefits at western harbour. Those on benefits will probably have to live on the reclaimed land beside the Granton Gasworks – Does that sit well with you Tom ? Is that alright ? How about the people being told by social services that their overcrowded housing is one reason for their children possibly being taken into care Tom ? Perhaps in the world of Bagels and Murals, no one faces these kinds of issues. Their omission is deeply unjust. It’s heavbily reflected in the price of beer. Now many places that match central Edinburgh and even the Filmhouse’s 5.25 for a pint of Guinness. Calling Leith Chooses “neo -liberal” is lazy and ill-informed. 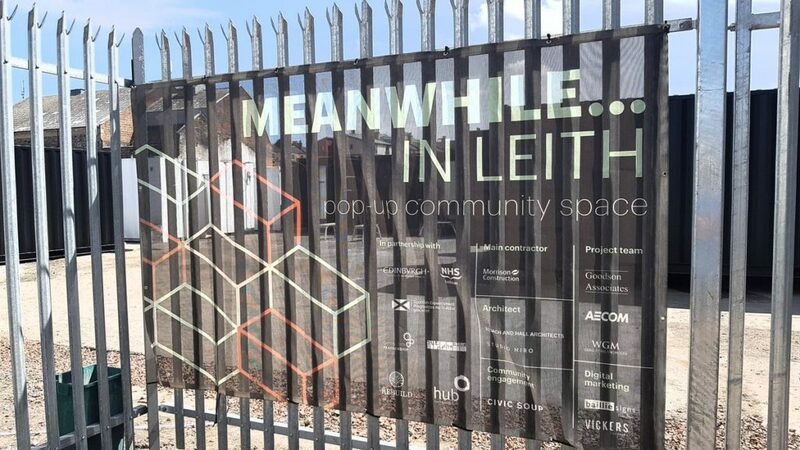 Local Leith Links Community Councillors, myself included, put a power of work into this. Yes, the money involved is peanuts in the greater scheme of things but isn’t to the wide variety of grass roots community projects that benefited and passed on that benefit to Leithers. As for the working classes always finding their areas “liveable”, that’s Marxist idealising of the poor and complete drivel. I’m not involved in anything “creative” in Leith and have no wish to be but I’ve lived here 27 years and it’s a hell of a lot better than it was in 1991. Regardless of ruffled feathers, indeed thanks to them, Stephen’s intervention has highlighted some of the processes seemingly in play in Leith. The public meeting was, for the most part, a far more positive occasion than some of the comments here are indicating. There were plenty of vocal Leithers who dealt in facts and expressed their appreciation for having a platform to air them. The appetite for more such dialogue was obvious. The umbridge being taken by arts organisations who are caught up in this, the ones mentioned in the article, is perfectly natural. But I would urge that they reflect and reconsider. This ‘creative placemaking’ lark needs its critics more than it knows. I should know, being the co-author of a successful bid for £1.6 million of Great Place Scheme funding in rural Co. Durham, home to hard up hill farmers and stigmatized pit villages. Check Westminster’s 2016 Culture White Paper section 2.2 for details on the thinking behind this scheme. This whole ‘place’ agenda is proving fruitful for the arts and public money is flowing in that direction. It is therefore incumbent upon recipients to wield that artistic power on behalf of the public, of the grassroots, and to fight like hell to ensure that the bottom-up is not railroaded by the top-down. Thanks to the artwashing furore across the Western world, any arts organisation whose creative-placemaking clearly facilitates gentrification will, as of 2018, not have any excuses.. Thanks very much for your comments Ewan. Thanks Ewan I thought the meeting much more balanced than characterised here. And thanks to Stephen for being brave enough to chair. There were a lot of marginalised voices which aren’t heard enough – inc the chap talking about the football stadium. And it was good to hear a bit about the Battle of Rennies Isle! Lost Leith history. Could you get in touch with me at e_allinson@hotmail.co.uk or on twitter @EwanAllinson. Thanks Mary. I felt the same and yet certain people from a certain arts/creative clique want to denigrate the conversation. For me, this is undemocratic. Artists, or painters and decorators? Artists or painters and decorators? Now that it’s become crystal clear who Leith Creative are and how they are happy to support the demolition of Leith for private profit, I feel justified in my avoidance of them and their various projects/entities. The ruin of Leith will come from this sort of 3rd sector gamesmanship. I don’t judge any organisation on its intentions, only on its results and we can see the results already. This was made all-too-poignant in the bizarre spectacle of showing films about poor people ON the actual slums they live in, and then watching the self-congratulatory tweeting of the organisers in the aftermath. It’s unpleasant to watch this kind of crass poverty tourism. It does not help the people of Leith. It’s revolting. Leith Creative are not sinister in the slightest. They are hardworking, underpaid, passionate folk who genuinely care about the creativity and Leith. You’ve totally misunderstood if you think they are in on some kind of plot to demolish Leith. The article makes the point that they are pawns in a bigger game, not the instigators. You are talking about people working in their spare time for the love of the arts and the place they stay, whilst still doing their day jobs and raising kids etc. Any funding they have got has covered expenses and given work to artists. I can assure you it doesn’t go in anyone’s personal pocket. They take a salary. Don’t pretend they don’t. I’m sure you noticed the implosion of Leith Late from “lack of funding”. Every public utterance by Leith Creative is a demand for more funding or a blowing of their own horn via their “blueprint”. I don’t know anyone who thinks the management of OOTB has conferred any real benefit to the people of Leith. They’ve taken public space, privatised its use , and sink the money back into more arty doings. To whose benefit? Certainly not people in need of social housing. The role of the arts in a community is not to dictate the role of arts in the community. It’s to BE part of the community. Listen and take action that will actually improve life here for those marginalised. Of course they don’t take a salary! They have day jobs! That is very true, Mary. a good cause,Unfortunately the tenants are allowed no input. WHO SHOULD BE HELPING WITH THIS RAPIDLY INCREASING PROBLEM. Please get in touch. You clearly have an inside track on the changes afoot. If you’re willing, I’ll interview you for Radio Summerhall and get your knowledge aired.